From the New York Times bestselling author of America’s Most Wanted Recipes comes more copycat recipes from your family’s favorite restaurants—with fewer calories! Ron Douglas has wowed home cooks across the country by uncovering the best recipes from hundreds of popular restaurants, including Applebee’s, California Pizza Kitchen, Chili’s, Olive Garden, P.F. Chang’s, and T.G.I. Friday’s. 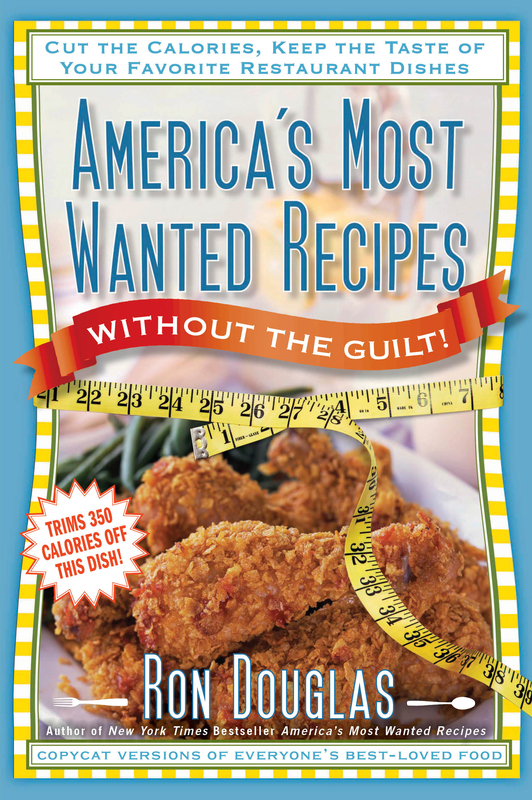 America’s Most Wanted Recipes Without the Guilt once again features delicious restaurant meals that can be enjoyed at home. But with the help of registered dietician and nutrition expert Mary M. Franz, Ron has created more than 150 amazing reduced-calorie versions. Take Bahama Breeze’s Jamaican Jerk Grilled Chicken, which usually contains approximately 960 calories. By using boneless, skinless chicken breasts, the entire family can enjoy generous, flavorful half-pound servings and save 590 calories. Or how about Dave and Buster’s Steak Fajita Salad? A restaurant portion contains a whopping 1,408 calories per serving, but Ron’s home-cooked version has 489. And for dessert? Macaroni Grill’s Reese’s Peanut Butter Cake has 635 calories per slice. Home cooks can easily trim that calorie count down to 435. Ron will show you how! Each recipe includes nutritional details, the number of calories you will save, and easy tips on how to prepare your favorite restaurant food without feeling the guilt. The book also features a section on restaurant alternatives, as well as a nutritional guide detailing the overall dos and don’ts when it comes to healthy eating. Experience the pleasure and satisfaction of cooking fun, delicious food for your family while also keeping them fit! Watch your wallet get fat and your tummy get flat! The America’s Most Wanted Recipes cookbook series has become well known for providing accurate copycat recipes of your favorite restaurant dishes. People really love having the option of saving money by re-creating restaurant-quality meals at home whenever they want—so much so that we’ve developed a huge following, with more than 1 million books in print and over 1.9 million monthly views of our Web site, RecipeSecrets.net. Now, in America’s Most Wanted Recipes Without the Guilt, we’ve focused on providing reduced-calorie versions with the same great taste that you’ll find at the most popular restaurants in the country. Yes, you can enjoy your favorite foods without the guilt! 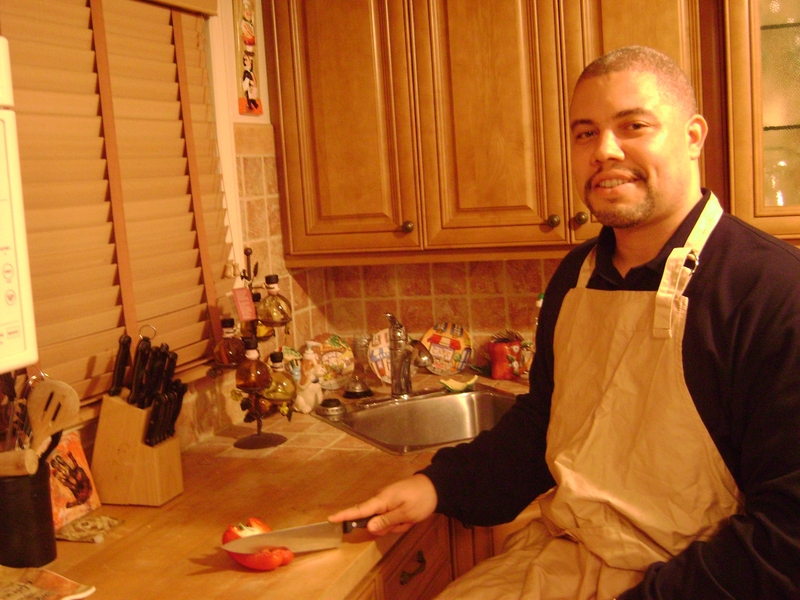 America’s Most Wanted Recipes Without the Guilt was inspired by my childhood friend and neighbor Troy “Escalade” Jackson, who passed away in his sleep in February 2011 at age thirty-five. Troy was a legendary athlete from Queens, New York, and had thousands of adoring fans and friends. He was a class act and will truly be missed. In the wake of my friend’s sudden passing, I decided to make America’s Most Wanted Recipes Without the Guilt more than just a cookbook. I felt an obligation to use the success of my cookbooks as a platform for educating readers on how to eat more healthfully as a better way of life instead of as just a temporary diet. We’ve enlisted the help of licensed, registered dietitian Mary M. Franz to provide nutritional details and healthy tips throughout this cookbook. We’ve also worked with Mary to provide you with a comprehensive health and nutrition guide, located at the back of this book. For each recipe in America’s Most Wanted RecipesWithout the Guilt, we’ve included simple ways to make your favorite restaurant meals healthier, along with the number of calories saved by doing so. We hope that our examples help readers learn how to choose healthier options in their everyday meal planning. It is no secret that Americans are getting heavier. Chances are good that you know someone who is struggling to lose weight, or maybe you are battling your own weight problem. If so, you know how incredibly difficult it can be to lose even a few pounds. And maybe, like many others, you have just given up and resigned yourself to living with your excess weight. The facts are stunning. According to the Centers for Disease Control and Prevention (CDC), about 34 percent of American adults are either overweight or obese, and 6 percent are classified as “extremely obese.” In addition, nearly 20 percent of American kids aged two to seventeen are now obese. Childhood obesity is of special concern because it often leads to poor health very early in life. For example, over half of obese kids have at least one risk factor for heart disease, such as high blood pressure or high cholesterol. In addition, children who are obese tend to be obese as adults. People who are obese experience many negative effects on their health and well-being. In addition to having less energy and a poor self-image, obese individuals have higher rates of serious health problems, including diabetes, high blood pressure, heart disease, and some kinds of cancers, and experience physical ailments such as arthritis and back pain. Why are we so heavy? There are many reasons for the explosion in the rate of obesity, but two of the main ones are an inactive lifestyle and poor eating habits. The past century saw a dramatic drop in the amount of exercise we get. Many jobs are now sedentary, in contrast to the active physical work such as farming that once employed most people. In addition, driving has replaced walking for nearly all of our errands and activities, so far fewer of the calories we consume are being burned. As for kids, cuts in school athletic programs, less outdoor play, and increased television-watching and video game use are to blame. Our poor eating habits are just as troubling. Skipping meals: Busy schedules and long commutes cause about 40 percent of Americans to skip breakfast; in addition, about one-third of people trying to lose weight skip meals regularly. However, missing meals, particularly breakfast, has been shown to lead to overeating later in the day, especially of high-calorie foods such as sweets and salty snacks. Bigger portion sizes: If you eat out in restaurants, you have probably noticed that the amount of food on your plate is increasing. Your eyes are not deceiving you! Over the past twenty years, restaurant portions have doubled and tripled in size, resulting in hundreds, if not thousands, of extra calories. This so-called portion distortion (discussed later on) is thought to be one of the main drivers behind the obesity epidemic. Eating more “empty-calorie foods”: Empty-calorie foods are processed foods that contain large amounts of calories, fat, sugar, and salt, but little nutritional value. You know what they are: chips, cookies, cake, pie, fries, candy, soda, and doughnuts. Because these calorically loaded foods are now available on nearly every corner (from convenience stores, franchise coffee shops, and vending machines), we have the opportunity to eat more and more of them—and we do. Not enough fruits and vegetables: Because fruits and vegetables are naturally low in calories and high in fiber, they fill us up and can help us lose or maintain weight. The U.S. Department of Agriculture Dietary Guidelines for Americans, 2010 recommends eating 2 cups of fruit and 2½ cups of vegetables each day (about nine servings all together). However, less than 30 percent of Americans meet this goal. Restaurant dining: Another possible reason for the increase in overweight and obesity is the number and types of meals eaten away from home. About 25 percent of Americans now eat fast food at least once a week, and many families have replaced dinners at home with take-out food or meals eaten at sit-down restaurants. Why is restaurant food so fattening? The answer lies in the cooking methods as well as the ingredients that are used: butter, fats, oils, cream, cheese, heavy sauces, and sugar and other kinds of sweeteners. One of the biggest culprits in boosting the calories in restaurant meals is fat, particularly butter, shortening, and frying fats, which contain high levels of saturated and trans fats. Because fat is a “flavor carrier” (meaning it enhances the taste and other sensory qualities of food), restaurant chefs often add it in large amounts to provide customers with the delicious dining experience they are seeking. Consider this: Nearly half of the fat in the aforementioned steak dinner is added during cooking, building in hundreds of extra calories. Of course, fat is not the only culinary demon here. Soft drinks, shakes, and desserts are often loaded with sugar. A large fast-food shake may contain 145 grams (36 teaspoons) of sugar, pushing the calorie count to 1,100! Fortunately, a new federal law now requires restaurants with twenty or more locations to post calorie counts for all of their menu items. This legislation was designed to help consumers make informed choices about what they are eating when dining out. Although many restaurant chains provide this information on their Web sites, they must now list calorie counts right on their menus. However, it may take many restaurants some time (perhaps a few years) to get up to speed with this new law. Americans like big things, and our restaurant meals are no exception. Throughout the past twenty years, restaurant portions have doubled and even tripled, leading to sky-high calorie counts for many restaurant dishes. And although many of us have come to accept these enormous portions as normal, the truth is that a typical restaurant meal often provides enough food for two or three people. The National Heart, Lung, and Blood Institute (NHLBI) has coined a term for this phenomenon: portion distortion. COMPARISON OF PORTIONS AND CALORIES 20 YEARS AGO TO PRESENT DAY FOOD 2O YEARS AGO PORTION CALORIES Bagel 3-inch diameter 140 Cheeseburger 1 333 Spaghetti with meatballs 1 cup sauce3 small meatballs 500 Soda 6.5 ounces 82 Blueberry muffin 1.5 ounces 210 Source: www.nhlbi.nih.gov. COMPARISON OF PORTIONS AND CALORIES 20 YEARS AGO TO PRESENT DAY FOOD TODAY PORTION CALORIES Bagel 6-inch diameter 350 Cheeseburger 1 590 Spaghetti with meatballs 2 cups sauce 3 large meatballs 1,020 Soda 20 ounces 250 Blueberry muffin 5 ounces 500 Source: www.nhlbi.nih.gov. Our dinner plates have also increased in size, from 9-inch diameter to 12-inch diameter since 1960; and many restaurant plates are even larger than that. It’s a no-brainer: Bigger plates mean more food—as much as 30 percent more than half a century ago—and with it, more calories. Unless we burn those excess calories off, we will store them as fat. 1. Take the quizzes on the NHLBI Web site (www.nhlbi.nih.gov) to find out how much you know about healthy portion sizes, and how much exercise you need to burn off excess calories from oversize portions. Some of the answers may surprise you! 2. Avoid “all you can eat” buffets. They are practically an open invitation to overeating. 3. Supersized means just what it sounds like: a huge portion with out-of-control calories. Avoid at all costs, even if the price is enticing. 4. Split appetizers and entrées with a fellow diner. You will still be full, but not uncomfortably so. 5. Look for smaller-sized entrées on the menu. Many restaurants are beginning to offer these. 6. Make a meal of appetizers, known as tapas in Spanish. Combining a variety of small appetizers and side dishes can lead to a satisfying meal that is much lower in calories. In fact, restaurants that serve only appetizers are rapidly becoming one of the hottest dining trends. 7. Use a smaller plate at home and fill it with food. After a few meals, you will get used to the smaller plate size and probably won’t notice that you are eating less food. If you enjoy eating out and would like to make it a healthier experience, the following tips and guidelines may be helpful. These descriptions of restaurant dishes are clues that they have been prepared with large amounts of fat, and should be considered deal-breakers. Fried/deep-fried/pan-fried: All three terms mean that the food has been cooked in hot oil, butter, or another type of fat. Creamy/creamed: Butter and/or cream has been used to make the dish. Scalloped: The dish has been baked in a cream sauce. Au gratin: The food, often potatoes or a vegetable, has been topped and baked with a crust made of flour, butter, and/or cheese. Battered/breaded: The food has been dipped in egg or some sort of fat, and then coated with flour, a batter, or bread crumbs before cooking. Smothered in: The term is usually followed by the word cheese, sauce, or cream. Stuffed: This means just what it sounds like—the food has been packed with a high-fat or starchy filling. Crispy: The food has been breaded or battered and then fried. Drizzled: The surface of the food has been covered with a layer of sauce, oil, or melted butter. The following cooking methods are lowest in added fats and may greatly reduce the calories in a restaurant meal. Steamed: Cooked over hot steam from boiling water. Poached: Covered and cooked in a liquid, usually broth, wine, or juice. Seared: Usually refers to meat; means that it has been cooked very quickly over very high heat with little or no added fat; done to seal in juices and flavor. Broiled: Cooked directly under very high heat, so that the fat in the food can drain away. Grilled: Similar to broiling, except that the food is cooked directly above the heat source, usually coal or wood. Sautéed/stir-fried: Cooked quickly over high heat in a very small amount of oil. Roasted: Often refers to meat, but sometimes vegetables; the food has been cooked uncovered in a hot oven. Braised/simmered: Cooked covered in a small amount of liquid. Ask for all sauces and dressings to be served on the side, and use them sparingly. Use a teaspoon (not a tablespoon) to add them to the food. And because the creamier ones are higher in fat and calories, it’s best to opt for marinara (tomato) instead of cheese or cream sauce, and vinaigrette or olive oil dressing instead of ranch or the blue cheese type. Skip the dinner rolls (you don’t begin dinner at home with them, do you? ), or ask your server to bring only a few, instead of a whole basket. Be aware of the calories you drink. Alcohol contains nearly as many calories as fat, and when combined with juice, soda, or other mixers, it may contain as many calories as a dessert. Did you know that a frozen margarita made with 2 ounces of tequila and 4½ ounces of cocktail mix can have over 250 calories? By comparison, a 6-ounce glass of wine contains less than 130 calories. If you are a nondrinker, skip that 16-ounce soda and ask for water with lemon or flavored seltzer water instead. Order a plain baked potato instead of fries. The humble potato is actually not that high in calories (a medium one has about 150 calories); however, once it is plunged into a vat of oil, the calorie count doubles. Split the dessert with a friend. I know, you want to eat the wholething yourself. But chances are you will feel that you have had enough by the time you’ve eaten half. We have seen that restaurant meals are often high in “bad” fat, sugar, salt, and calories. And even healthier restaurant entrées can offer portions that are two and three times larger than we need. One way to avoid the pitfalls of restaurant eating is to cook more at home. This may seem obvious, but for many busy on-the-go families, sitting down to a home-prepared meal is becoming a thing of the past. For many working parents, getting a meal on the table after a hectic day at the office seems like an impossible task. But it doesn’t have to be. There are many simple, delicious, and easy meals that can be prepared in 30 minutes or less. The recipes in this cookbook will help you find great meals that are just right for you and your family. • You can control the amounts of fat, salt, and sugar that you cook and season food with. • You can choose healthier types of fat for cooking and baking, like olive and canola oils. • You can tailor the dishes you make to meet special dietary needs of family members. For example, you can use less salt to accommodate someone on a low-sodium diet. • You can use the freshest ingredients available and choose from locally grown produce. • You can avoid the additives, preservatives, and other unnecessary ingredients that are often found in restaurant and convenience foods. • You can give children hands-on cooking lessons. Kids who are introduced to cooking at an early age are more likely to have a better appreciation of food and nutrition. • Cooking at home also provides you with endless opportunities for preparing creative and healthy meals. You can make sure that the meals you prepare are nutritionally superior (as well as tasty) by choosing your ingredients wisely and making healthy substitutions whenever possible. The following suggestions are tried-and-true substitutions that will help lower the calories, fat, and sugar in the dishes you prepare at home. Eggs: Use 2 egg whites instead of 1 whole egg. You can also substitute 2 teaspoons of ground flaxseed mixed with 2 to 3 tablespoons of water for 1 egg in baked goods. Simmer the flaxseed and water until the mixture takes on a gummy egglike texture, and let cool before mixing with other ingredients. Generally, you can substitute half of the eggs in a recipe without sacrificing flavor or texture. Butter: Substitute an equal amount of canola oil for the butter. This works well for most recipes. Butter, oil, and other fats: You can substitute an equal amount of applesauce or mashed banana for the fat in baked goods; for example, 1 tablespoon of applesauce can replace 1 tablespoon of butter or oil. For some recipes, like spice and chocolate cakes, an equal amount of canned pumpkin will also work. As with eggs, it is best to replace only one half of the fat in a recipe with fruit, since a certain amount of fat is needed for tenderness and flavor. Cream: Use an equal amount of evaporated skim milk. Sour cream: Use an equal amount of low-fat or nonfat sour cream, or creamed low-fat cottage cheese. Plain nonfat yogurt may also be used, though it may give a slightly different texture. White flour: Use ½ to 3/4 cup of whole wheat pastry flour instead of 1 cup of white flour. Whole wheat flour may also be used, though it tends to give a somewhat drier and denser texture to baked goods. Sugar: You can cut the amount of sugar in a baked goods recipe by as much as half without sacrificing taste. When cutting sugar, you can also add extra cinnamon to boost the flavor. Unsweetened chocolate: Use 3 tablespoons of cocoa powder for every ounce of unsweetened chocolate in a recipe. Marinades for meat, fish, and vegetables: Cut the amount of oil in half and replace with equal amounts of pineapple juice and chicken broth. Cake frosting: Sprinkle cake with confectioners’ sugar or top with crushed pineapple in place of frosting. Cream soups: Use mashed potatoes as a thickener instead of cream or cream sauce. Finally, for kids who are fussy about eating vegetables, try adding finely grated carrots or green peppers to spaghetti sauce, and simmer. The flavor of the vegetables will blend with the tomato sauce, and the kids will never know they are eating those hated vegetables!